Normally, late August and early September are fairly dry in Iowa. Just how rare is the heavy rainfall that’s fallen across Iowa over the past 10 days? To answer that question, Professor Gabriele Villarini, a faculty affiliate of the Iowa Flood Center at the University of Iowa, worked with Assistant Research Scientist Wei Zhang to provide some context for the current rainfall situation. Zhang and Villarini are both part of IIHR—Hydroscience & Engineering, where Villarini serves as director. He says that the extremely heavy precipitation is indeed unusual, as seen in the graphic (above) that covers the period between August 24 (when the rain started) and Sept. 5. It is based on a gridded rain gauge product. Top-left panel: This panel displays historic average precipitation for August 24–Sept. 5 during the 1981–2010 period. This 30-year period is generally used to frame recent events in a longer-term climatological period. Take home: We would expect on average about 2 inches of rainfall or less in Iowa during this time period. Bottom-left panel: This graphic displays the current observed precipitation in 2018. Take home: The current rainfall is much more than we would expect for this time of the year; some areas of eastern Iowa have values on the order of 8–10 inches. 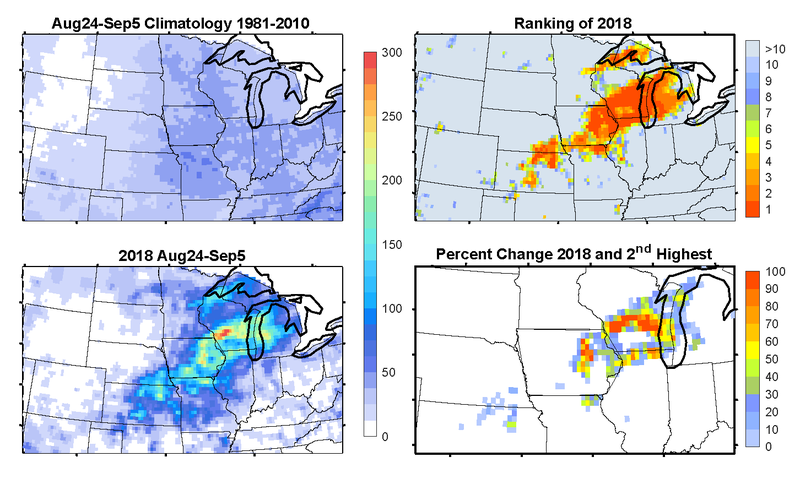 Top-right panel: This panel shows the ranking of 2018 precipitation during this period with respect to the 1948–2018 period. The redder areas represent rainfall extremes, with values of “1” indicating that this year was the highest since 1948. Take home: The current rainfall is the largest on record (since 1948) in large areas of central and eastern Iowa. Bottom-right panel: For the locations where precipitation this year was the greatest on record, we show how much greater the rainfall has been this year than the next largest year. For instance, a value of 80% indicates that this year was 80% larger than the second largest year on record. Take home: The rainfall this year is extreme, in some areas up to 80% larger than the second largest year. For more information, visit the Iowa Flood Information System. Rock Valley previously experienced flooding as recently as 2014. 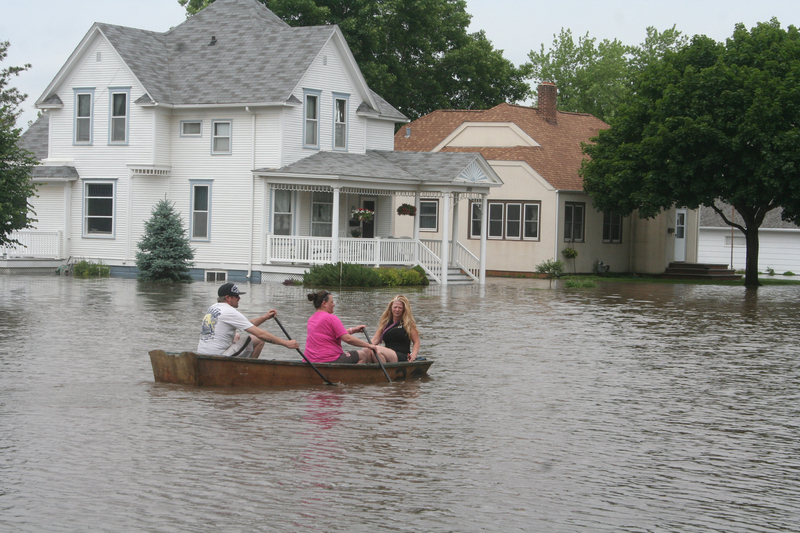 Flooding slammed Iowa again this week, in what has become an all-too-familiar situation. Heavy rainfall in Northwest Iowa has forced evacuation of homes and businesses in Rock Valley and raised stream levels throughout the region. Significant rain fell over the Iowa Great Lakes region on Sunday, raising stream levels on the Des Moines River to moderate flood stage near Estherville on Monday. Central Iowa, too, is experiencing flooding. According to The Des Moines Register, the Saylorville Lake beach and other recreation areas will likely be closed over the upcoming July 4 holiday because of rising water levels. Officials expect the Saylorville Reservoir to approach its limit next week. Rain continues in Central Iowa. Some areas of Polk County received up to five inches of rain Monday and early Tuesday. 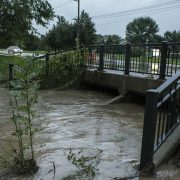 The Iowa Flood Center at the University of Iowa provides 24/7, up-to-the-minute information on current flood conditions on the Iowa Flood Information System (IFIS), which is available to the public online. IFIS provides current stream levels, flood alerts and forecasts, inundation maps for many river communities, and more. The Iowa Flood Center was instrumental in bringing a new $96.9M grant from the U.S. Department of Housing and Urban Development to Iowa for a statewide watershed improvement program, the Iowa Watersheds Approach (IWA). The IWA will address issues associated with the devastating and dangerous floods Iowa communities experience year after year. Iowans have already tried, tested, and approved the concepts of the IWA. The Iowa Watersheds Project (IWP) is entering its final year, and landowners and community members are noticing the benefits. Iowa Flood Information System offers Real-time Flood Information—Perfect for a Rainy June! During this wet and rainy June, we invite you to check out the latest conditions in your part of the state by visiting the Iowa Flood Information System (IFIS). Individuals can access IFIS by visiting http://ifis.iowafloodcenter.org. 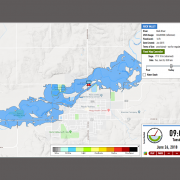 (IFIS) is an online tool developed by the Iowa Flood Center (IFC) at the University of Iowa. IFIS provides a user-friendly, interactive web application that allows all Iowans access to community-based flood information, including current stream and river level data from more than 200 IFC stream-stage sensors across the state. Flood inundation maps for Mason City, Spencer, Humboldt, Charles City, Waverly, Elkader, Waterloo/Cedar Falls, Independence, Ames, Des Moines, Cedar Rapids, Iowa City, Hills, Columbus Junction, Maquoketa and Ottumwa. (IFIS) helps Iowans make better-informed decisions on flood planning and mitigation efforts and alerts communities in advance to help them prepare for and minimize potential flood damage. Watershed management groups across the state can also use IFIS to assist with conservation planning to improve soil and water quality and protect people and infrastructure. The IFC is part of IIHR—Hydroscience & Engineering, a leading research institute based at the University of Iowa’s College of Engineering. The IFC was established in the spring of 2009 following the 2008 flooding disaster. Iowa legislators recognized the need to establish a center for flood research and education to help Iowans better understand their flood risks. It is the nation’s first academic center devoted solely to the study of floods. Breanna Zimmerman, Iowa Flood Center Outreach Coordinator, 319-384-1729, Breanna-zimmerman@uiowa.edu. https://iowafloodcenter.org/wp-content/uploads/2018/02/Full-Color-Middle-Wave-Transparent.png 0 0 Breanna Zimmerman https://iowafloodcenter.org/wp-content/uploads/2018/02/Full-Color-Middle-Wave-Transparent.png Breanna Zimmerman2015-06-22 14:10:412015-06-22 14:10:41Iowa Flood Information System offers Real-time Flood Information—Perfect for a Rainy June!